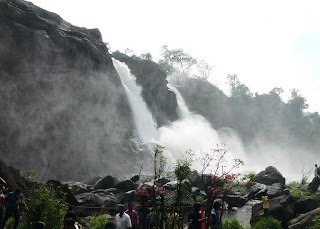 Athirapilly Falls is around 70KM from Kakkanad. The shorter-route is using the turn-off before reaching Karukutty on NH-47 (Karayamparambu) but there are several stretches that are narrow and not well-maintained. 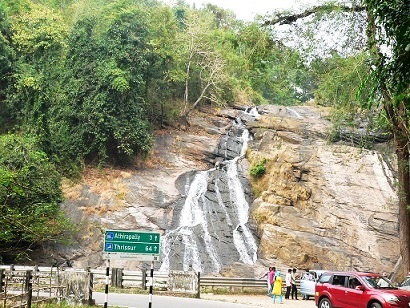 The alternative is to get to Chalakkudy and then take the direct route to Athirapilly (Chalakkudy-Athirapilly is about 35KM via Chalakudy-Anamala Road SH21). There is a forest checkpoint on the way and your vehicle number is noted. 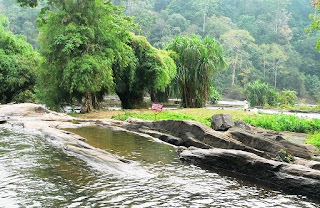 Both routes are very scenic although on the shorter route, just before reaching Chalakudy-Anamala Road there is a bridge that cross the Chalakkudy River. The views from the bridge are quite a treat and there are steps down on either side of the bridge that gives you access to the river. Silver Storm Water Theme Park is located there and the entry gates are right after the bridge-crossing. Dream World is another Water Theme Park in the area. 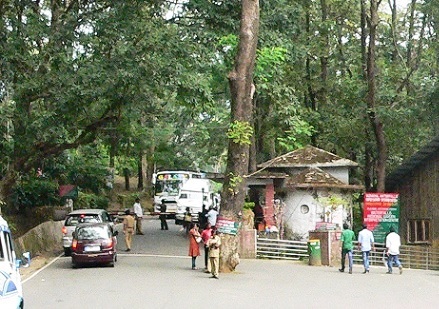 Among tourist attractions in the area, Kauthuka Park is the best rated one - it is a unique nature conservation center for research and education nurtured by founder & architect Mr. Varkey Veliyath. 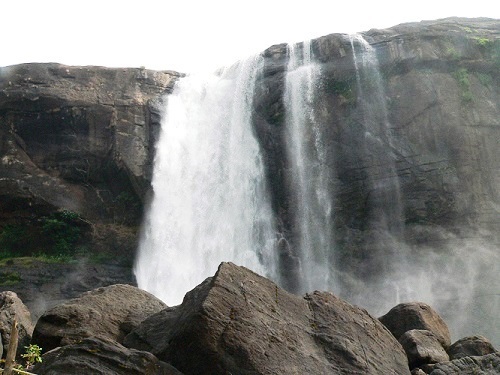 When coming from Ernakulam area, it is a slight detour to get there - instead of taking the turn-off at Chalakkudy, go a little further on NH-47 to Potta and take the Potta-Elanjipara Road - it is a couple of kilometers on that road to the site and going a few kilometers more gets you to the Chalakkudy-Anamala Road). There is a single ticket counter for both Athirapilly & Vazhachal Water Falls at the Entry Gate at Athirapilly. They are open 8AM to 5PM (Tickets are Rs 30 for adults, Parking Rs 20, and Camera Rs 20, kids 5-13 just Rs 2, and below 5 free). Although the sites are highly popular, many visitors opt for day-trips partly because accodomation options are very limited. Rainforest boutique resort is a high-end option next to the falls. Riverok is an alternative more economical option. There is also a budget option by KTDC - Motel Aram - two rooms - no internet booking. 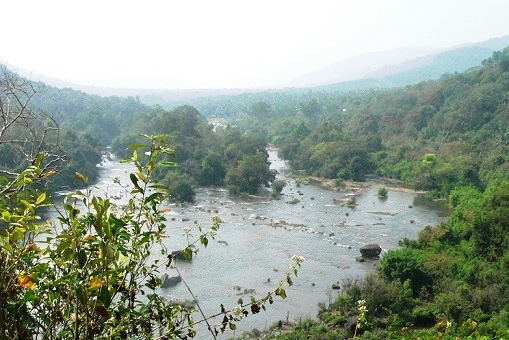 Vazhachal is 5KM from Athirapilly. 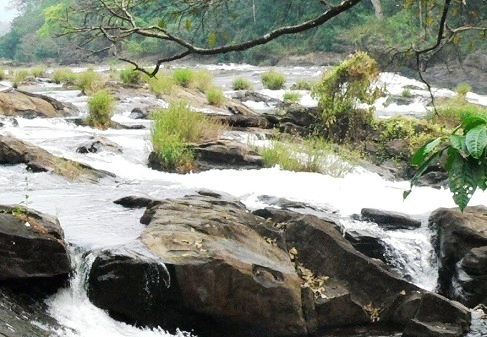 It is a smaller falls and so is less popular compared to Athirapilly. Parking is tight (mostly on the road-side) at either location. One strategy is to opt to visit Vazhachal first and then on the way back park at the first available slot and walk the rest of the way back to Athirapilly. The Falls area at Vazhachal (about 500 meters in all) is very accessible to most people as the terrain is not that steep - should be able to walk around the entire stretch. Nobody was bathing at the site, but several were getting down to wet their feet.Over the years, both the Falls have gained notoriety as several people lose their lives every year - the water is very tempting but extremely dangerous. Forest Department has placed several sign-boards at both sites warning visitors not to enter the water. This is however inconsistent as there are areas cordoned-off and checking with security personnel indicates dipping/bathing is allowed in those areas. In Athirapilly, there is a roped in area where people are in the water but here again the board says getting in the water is not allowed. Also, there were several people outside the roped in area as well. There is security and they seem to ask people to move away although very inconsistently - apparently there is no enforcement whatsoever and the rules are not at all clear. In both places, the upper falls has access to the water. It is a longer walk to get to the falls in Athirapilly and it is steeper as well. Still, most people should have no trouble accessing the upper falls area. The views are stunning at some spots - the main falls are clearly visible but the two smaller falls on the far-side are less so from the upper falls area. To get to the lower falls, go back up to the area where the EcoShop is and take a Left (there is a direction board). The way down has railings part of the way - one can also choose to bypass the winding path by going straight down using the hiking path (much steeper). One gets a full view of the falls from this location - all three falls are visible and there is heavy mist at some spots. The area is less accessible as the path is steeper and longer. Overall, both sites are much more commercialized compared to a decade ago. Lots of curio shops on either side of the road in both places and aggressive monkeys line the area as well. About three kilometers on the way from Athirapilly to Vazhachal is Charpa Waterfalls, a beautiful falls right by the road-side. It is worth a stopover (there are no services there).